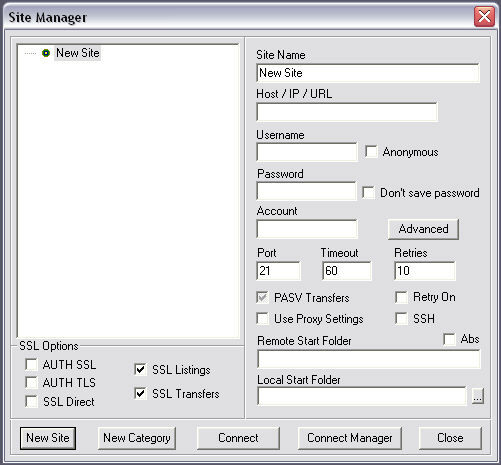 In order to connect to a FTP server, we will first set up a site in the Site Manager. or the button on the right side of the main window. Once you have started up the site manager, the first thing you want to do is click on the "new site" button. This will set up a new site profile that we will use to connect to a FTP server. 1: Host, Internet Address (IP), or URL. This information is usually provided by your ISP or server provider. The only additional information your ISP may provide is an alternative port. In most cases the port will always be 21 for standard and SSL FTP connections and 22 for SSH. For this example, we will use the following information to connect to an anonymous FTP server. Anonymous servers are commonly used as archives where files and updates can be retrieved for various software packages. This example is our first test to make sure you can connect to an FTP server successfully. You have probably already noticed that you can hit the anonymous button and it will fill in the username and password for you. This log shows the progress of the connection being established. Remember that if you are using a dialup account, you need to already be connected to the internet. If the connection is made, the connection dialog will disappear and you should be returned to the main Core FTP screen. Upon successful connection, you will see the right (remote) list of files listed. These are files that are on the remote server. Once you have been able to connect to this anonymous FTP server, try creating a new site and entering in the server information (host, username, password) that your ISP or web host provider gave to you. If you can connect using your own information, you have now completed the first step in using FTP!